Recently, based on observations from the Space Particle Component Detectors (SPCDs) on Fengyun-1, an unusual long-lived relativistic electron enhancement event is investigated in detail by Dr. YANG Xiaochao, Prof. Zhu Guangwu, and Dr. SUN Yueqiang from the Laboratory of Space Environment Exploration, the National Space Science Center (NSSC), the Chinese Academy of Sciences (CAS). Due to its penetrating nature, the relativistic electrons with energy >1MeV are believed to be a serious space environment hazard. While relativistic electron fluxes enhance remarkably, the probability of spacecraft malfunctions and failures was sharply increased. 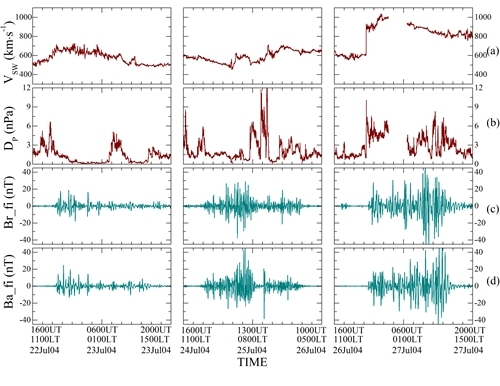 The unusual event was excited by three sequential Coronal Mass Ejections (CMEs), which stimulated Interplanetary Magnetic Field (IMF) abrupt changes, extra high speed solar wind and strong geomagnetic storms and substorms. By investigating this event, researchers found that multi acceleration mechanisms can contribute to this strong enhancement event; and the decay of the enhanced outer zone is correlated to the location of the plasmapause. 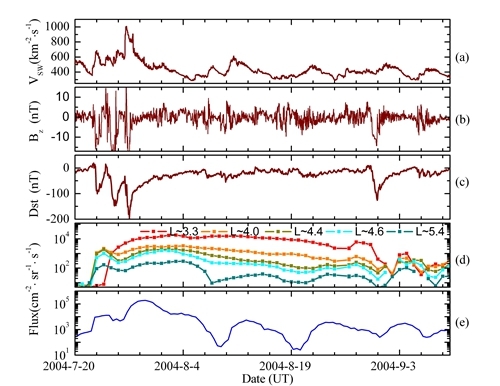 Based on thorough analysis on geomagnetic oscillations by a band-pass filter, they also revealed that the high-speed solar wind and frequent impulses of solar wind dynamic pressure induced the strong and long-lasting ULF waves. 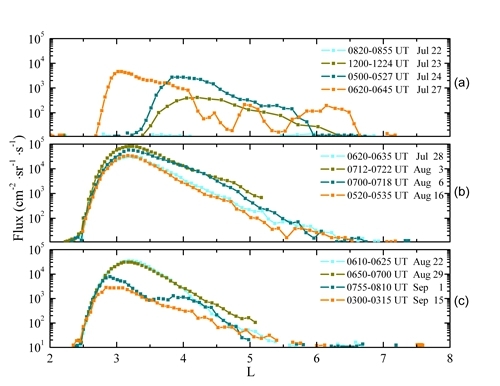 In conjunction with the examination of the energetic electron evolutions in the magnetosphere, the research group suggests that the drift-resonant between ULF waves and energetic electrons injected by substorms is an important acceleration mechanism in this event. Moreover, the intensification of chorus in the same period implies that the local acceleration by chorus could be another mechanism contributing to this unusual event. Their work entitled An unusual long-lived relativistic electron enhancement event excited by sequential CMEs was published on the Journal of Geophysical Research (JGR): Space Physics 2014 VOL 119 hosted by the American Geophysical Union (AGU). Citation: Yang, X. C., G. W. Zhu, X. X. Zhang, Y. Q. Sun, J. B. Liang, and X. H. Wei (2014), An unusual long-lived relativistic electron enhancement event excited by sequential CMEs, J. Geophys. Res. Space Physics, 119, doi:10.1002/2014JA019797.